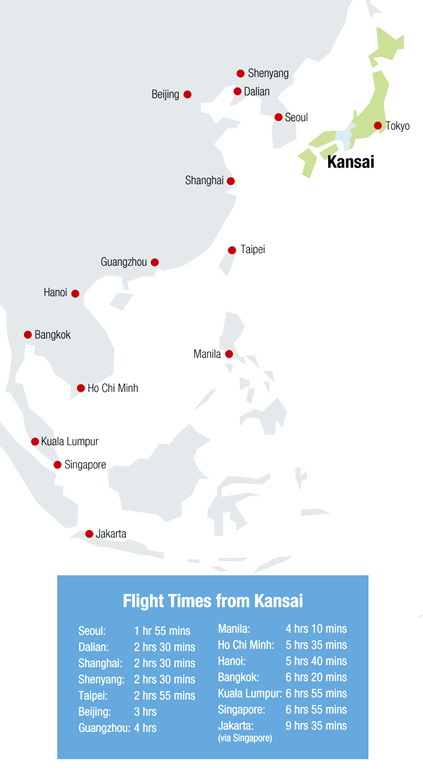 Kansai comprises Nara and Kyoto, cities whose history includes more than 1,200 years as the center of political power in Japan, as well as the global cities of Osaka and Kobe. The region has been a vibrant hub of cultural and economic interaction with other Asian countries since ancient times. In fact, Asia is the destination of nearly 70% of exports from Kansai and the origin of nearly 60% of imports to Kansai. With a GDP rivaling that of Australia, Kansai is Japan’s second major economic center. Kansai boasts a high concentration of key industries like electronics, machinery, steel, chemical, and textile, as well as such leading-edge industries as robotics, nanotechnology, and life sciences. This concentration is due to the large number of world-class, technologically advanced small and medium-size enterprises located in the region. Kansai has traditionally been at the vanguard of coordinated efforts among all stakeholders—government, industry, academia, and citizens groups—to tackle the environmental problems that come with industrialization and population growth. A shining example of this is Lake Biwa, Japan’s largest body of fresh water, whose successful remediation has become a positive model for parts of the world facing similar pollution problems. Kansai has been leading the development in Japan of energy-saving and new-energy technologies, and a number of stakeholder-driven projects to combat global warming are making Kansai one of the most environmentally advanced regions in the world. 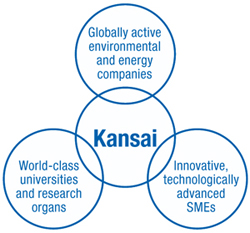 Kansai is home to many globally active, technologically advanced companies in the environment- and energy-related industries. The region also has a high concentration of small and medium-size enterprises whose innovative, one-of-a-kind technologies put them at the center of these industries. And the wealth of universities and public research organs that support leading-edge research and turn out the technological movers of tomorrow is, in effect, driving environmental and energy industries that are the envy of the world.